We have a challenge for you…. Our challenge is to get you to go a day without using one of your arms or legs like you have a broken arm or leg. Ways to do this is by wearing a cast or splint on your arm or leg, wrapping your arm in a ace bandage, using a sling, or walking with crutches or a walker. On the challenge day, take a picture of yourselves with your broken arm or leg. 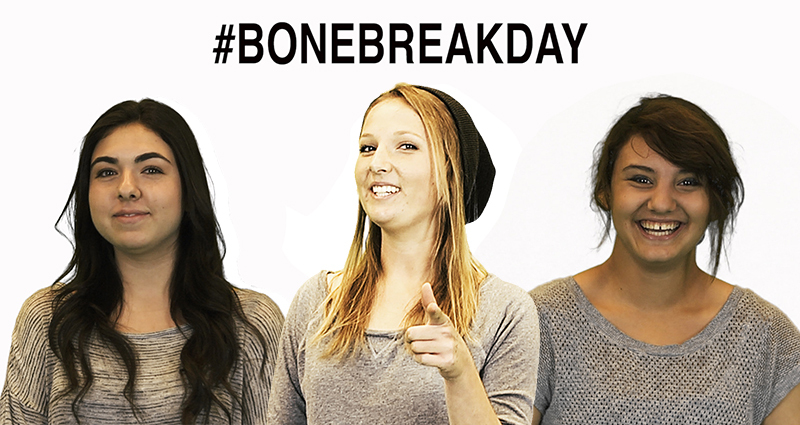 Use the hashtag #bonebreakday to post. We decided to do this Bone Break Day Challenge to increase the awareness about osteoporosis and building and maintaining strong bones. Building strong bones now will lower your risk of getting osteoporosis later. Bone Mass: 90% of your bone mass is formed by age 18. Your preteen and teen years are the critical time to build the strongest bones possible. Peak adult bone mass is achieved by your late 20s to early 30s. Daily maintenance is essential to build the highest bone mass possible that must last your lifetime. Sodium: Too much sodium is bad; the more sodium in, the more calcium out. The recommended daily sodium intake is 2300 mg but over 90% of teens exceed that amount. The high salt content is not from the salt shaker but rather foods you eat like pizza and processed luncheon meats. Use Bone Break Day Challenge to share and inform your friends and family about osteoporosis and taking steps to build strong bones and to not break a bone now or later.